A week after letting in five goals, Willy Caballero made three saves in a penalty shootout against Liverpool to help Manchester City win the League Cup on Sunday and claim its fifth major trophy since 2011. Though the Argentine goalkeeper is second-choice behind Joe Hart in the Premier League and the Champions League, he has been a regular in the cup teams fielded by coach Manuel Pellegrini. And Pellegrini’s faith in the 34-year-old keeper was duly rewarded with a memorable display in the penalty shootout after the two sides had ground out a 1-1 draw after extra time at Wembley Stadium. Caballero stood firm during the shootout, opting not to second-guess which way the Liverpool players would send their penalties. His decision paid dividends as the spot-kicks of Lucas Leiva, Philippe Coutinho and Adam Lallana were all saved – and Yaya Toure went on score the final penalty to give City a 3-1 victory in the shootout. Pellegrini held firm to his decision to give Caballero a final berth despite calls by some City fans to catapult England’s number one, Hart, into the side to face Liverpool. “I prefer to lose the title than to lose my words,” Pellegrini said. Caballero’s compatriot, City defender Pablo Zabaleta, backed the decision. Pellegrini, who is in his final months at City following the club’s announcement earlier in February that Bayern Munich coach Pep Guardiola is to join in the summer, heaped praise on both his goalkeepers. He said Caballero “deserved this moment” and that Hart’s demeanor over the decision showed him to be “a very good person” in addition to his traits as a top goalkeeper. Pellegrini faced a barrage of criticism a week ago when he put out an under-strength side in a fifth round FA Cup tie against Chelsea. Caballero featured in the subsequent 5-1 defeat, which came before a crucial week that also saw City travel to Ukraine to meet Dynamo Kiev in the first-leg of the Champions League’s round of 16, as well as the League Cup final against Liverpool. Having won 3-1 against Kiev and defeated Liverpool, Pellegrini felt his team selection against Chelsea had been justified. “I think that the decision I took last week was very important to win these two games,” he said after lifting City’s second League Cup in three years and the club’s fourth overall. It has also won the Premier League twice and the FA Cup once since the club was taken over by Sheikh Mansour bin Zayed bin Sultan Al Nahyan, a member of Abu Dhabi’s royal family, in 2008. 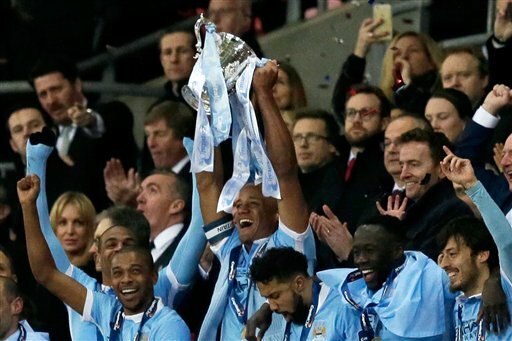 Pellegrini could add more to City’s trophy cabinet this season. His team is still in the hunt for the Premier League title despite being nine points behind leader Leicester, and has a game in hand. City also looks set to make the quarterfinals of the Champions League after beating Dynamo Kiev. Next up for City is Liverpool again in a league fixture on Wednesday. Liverpool coach Juergen Klopp will look to see his team strike back quickly from the Wembley disappointment, though he conceded that his team felt “rubbish” after losing out in the final. While City is enjoying the most successful period in its history, Liverpool is experiencing one of its most barren runs ever. Since 2006, when Liverpool won the FA Cup, it’s only added one trophy, the League Cup in 2012. Its defeat was its first in a major final on penalties. It had won its previous five. Liverpool started the sharper of the two sides but wasn’t able to engineer any notable chances during a drab first half. City started the second half brighter and took the lead in the 49th minute when Reds keeper Simon Mignolet failed to deal with a cross shot by Fernandinho. It should have been a routine save but the ball went straight through Mignolet. Coutinho equalized for Liverpool in the 83rd minute from close range after an effort by Lallana hit the post and rebounded neatly into the path of the Brazilian midfielder. Both sides had chances to take the lead in extra time and Divock Origi nearly won it for Liverpool in the 110th minute but his header from close range was beaten away by Caballero. Caballero’s day would not end with that save.